Challenge completed! If you feel like doing this challenge, go for it! I’d love to hear your answers! That’s all for now! Until next time! Hello everyone! One more day left of this disney challenge and I’ve got to say, it’s been pretty fun posting these and hearing other people’s answers in the comments area! Today’s challenge is to name my favourite theme park attraction. If you read my post yesterday, you’ll know that I’ve never been to any Disney theme park, so I wouldn’t know about any attractions. But for the purpose of this post, I choose Pirates of the Caribbean, mainly because of the movies that came out of it! I love Jack Sparrow’s antics and adventures! If you have any attractions that you love, feel free to leave them in the comments below! Have a nice day! What about you all? Have you ever been to a Disney theme park? Are there any fond memories you’d like to share? Because I would love to hear about it! What’s your favourite Disney quote(s)? Or are you like me and can’t shorten it into a line or two? Tune in next time for tomorrow’s Disney challenge! Thanks for reading! Hi again! It’s Day 26 of the Disney Challenge, which means I have to pick the saddest death I’ve watched on Disney. For that, I’m going to have to repeat Day 24: a movie that makes you cry and pick the death of Bambi’s mother. It’s honestly the saddest I’ve ever felt with Disney. That’s all for today. If you have comments or questions, please share them in the section below. Until next time, keep reading! What’s your favourite Disney moment? Share it in the comments below! Well, that’s one more Disney challenge done, and five more to go! See you later, lovely readers! If you have any Disney sad moments you’d like to share, feeler to share it below. Take care! Hi everyone! This post’s for the Disney Challenge! The purpose of today’s challenge is to name a movie that made you laugh. First thing I wanted to say is that every movie that I’ve liked has made me laugh. It’s nearly impossible to choose a single one! 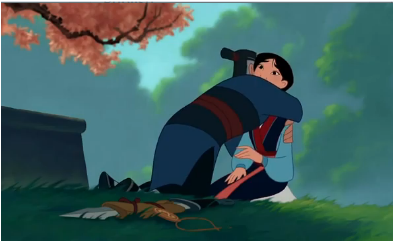 I have an answer to this question though; it’s Mulan. I’ve mentioned this movie so many times and have watched it even more, yet it still is one of the funniest movies I’ve ever watched! That’s it for Disney today. If you have any comments or questions, feel free to leave them in the comments section below. Take care and keep reading! Welcome back! I’m here again with another Disney Challenge. Eight more days to go after this! Since today is Day 22, it’s time to pick an underrated movie. This one’s a bit tricky since some of the movies I’ve previously mentioned could fall in that category. But I kind of feel like that’s cheating, so I’m going to go with Treasure Planet. I didn’t even plan on watching this movie; it just came on tv and seeing as there was nothing else on, we (my family and I) just watched it. Know any underrated Disney movies that I might enjoy? Feel free to leave comments below! I hope you all enjoy your long weekend (for those of you who have Labour Day)!